Piston type (Piston Filling Machines) filling is a traditional filling method. It employs a rank for reciprocating motions combined with an eccentric adjustment device for filing volume adjustment. The filling volume adjustment range is relatively small and limited. It is not proper for wide range filling and large filling volume with higher viscid liquid . Spiral type filling is an universal filling method. It employs an eccentric screw combined with a tight joint between screw and bushing that run in a single direction. A vacuum suction force is created to draw the liquid. The screw is precision machined by a CNC lathe, ensuring filling accuracy to 0.5%. As an eccentric screw drives the filling motion, the reaction force is reduced. This special design permits the machine to fill higher viscosity liquid .This filling system with easy access is to make adjustment for different filling volume by the LCD touch screen controller. 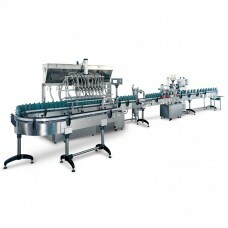 This Piston Filling Machines is designed to handle from water-thin to high viscid fluids. Filling volume is able to be adjusted by LCD touch screen control panel. Special application for chili sauce, tomato ketchup, edible oil, motor oil and medical cosmetic, chemical liquid products. ● Sanitary spiral filling pump performs filling viscous and general liquid. ● Stainless steel frame construction to meet GMP requirement. ● Each spiral filling pump is driven by an individual motor for high accuracy of liquid filling. ● No change parts are required for different bottle sizes. ● Mitsubishi PLC combined with LCD touch screen control panel. ● Digital setting allows different filling volume adjustment easily. ● 20 job memory for easy recall.